When we started selling vinyl records online back in 1999, shipping rates were pretty cheap. You could send a record overseas for less than $5 back then. Almost every year since, USPS has raised shipping rates, especially for international packages. Not once have the rates been lowered. You would have to think that maybe once they would decide to drop them in an effort to drum up more business. But it hasn't been the case. Ineffective governance and rising fuel costs have certainly contributed to the problem of skyrocketing shipping rates. Plenty of folks are upset about the changes. I was able to find four pretty good articles online referring to the subject of higher shipping rates for vinyl. Our international sales were extremely brisk throughout the 2000's, but since 2010, they have been sluggish. Much of it appears to be due to shipping rates. Customers do have limits to what they will pay for shipping, and who can blame them? We are doing all we can to keep these costs down, but we are powerless to control USPS rate changes. All that we can do is regularly provide the best vinyl and services we can, and hopefully attract some international sales. One positive change from the recent updates is that USPS First-Class International mail is now able to be tracked to all destinations. This new and better service comes at a price: The price increases on First-Class were among the largest of all. Overall shipping prices are up between 5 and 15% for the USPS services that we use to ship records, which include Media Mail and Priority Mail. We've absorbed some of the increase in an effort to bring our customers the lowest possible shipping rates (while also remaining a viable business - there's no such thing as free shipping!). Media mail is going up to $4.25, up from $3.99 and that's not too bad if you ask me. Thankfully, we still have Value Select Mail as a great economy option for international buyers, starting at only $7.99 for one record shipped to Canada. Also new for the first time are bulk shipping rates. If you are in the market to buy 50 records or more you can enjoy some nice discounts, and these new bulk rates can be used to ship our Wax Packs as well. Check out the new bulk rates on our FAQ page, or just add items to your cart to see the shipping options and their prices. As governments around the world look at parcels as a way to extract more revenue, this trend of rising shipping rates is likely to continue in the future. We can only hope that rate increases in the future are limited. Or maybe it's time for an aggressively priced new competitor in the shipping market? $4.25 is excessive if you use discounted printed postage. About 2.89 media mail contiguous states, and .50c for a mailer if purchased in bulk quantities. 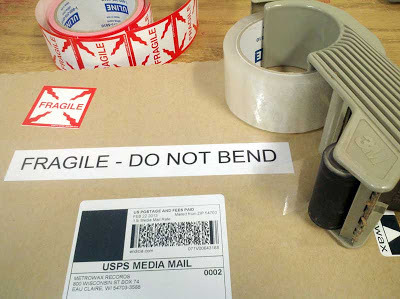 tape and fragile sticker.25=$3.64. It should've remained at 3.99 max, in my opinion. I occasionally sell, too. The order processing fee is probably the most controversial bit. It is there to help with the costs of the manual labor it takes to pack and ship orders. Some record stores do ship for less than $4 (not many and not by much however), but they seem to build extra costs into the records themselves to bridge the gap. No business can operate for too long at a loss. Even a small loss per order is a big problem when it's accumulated again and again over thousands of orders. We try to keep prices of the vinyl as low as possible, but in order to do that, we must cover all costs of shipping and order generation. We don't do free shipping and other gimmicks to sell records. We could price everything at $6 and up instead of $3 and offer cheap or free shipping, but it's not our style to play games with our customers. We charge about what it costs us to ship the product, and always have. Believe me, I wish costs were lower too! We'd sell a lot more records! These costs are a fact of life and even after all of that, it's an extra quarter. That's a pretty small cost to help keep Metrowax strong for the long run. Edit. Just ordered boxes and the price went up to 66 cents apiece! This stuff never goes down in price - only up. My only hope is that we can eventually increase sales and volume to the point where we can buy several thousand boxes at once to get the costs as low as possible. The problem is unless you plan on using bundles of boxes for furniture, you need storage space for that, which also costs money. Honestly shipping prices never bother me, I kindof just live with it. Especially if I want the record bad enough I'll pay over the top shipping rates. Shipping to or from overseas has always been a problem I figure it's just the nature of the beast. I just love playing vinyls and compared to my enthusiasm the postage cost is minor. So I don't really care. But interesting to know the situation. Appreciate the sentiment. I agree 100% that if you are an enthusiastic collector who is passionate about finding certain pieces of vinyl, you are left with accepting the new normal of higher shipping rates. When youre buying records from US to Croatia shipping rates are 19 $ approx. which is insane especially if I decide to buy a 5 $ record. We still have our economy option available for $9.99 (single 12").. but unfortunately, it is due to rise soon.